The United Kingdom was scheduled to leave the European Union tomorrow, March 29, at 11:00 p.m. GMT. That date was put on hold when Theresa May requested the EU extend the deadline for Brexit to June 30. Although the EU granted an initial extension only to April 12, the uncertainty surrounding Brexit continues. Predicting the eventual outcome of the chaos surrounding Brexit is a mug’s game, so I won’t even try. The U.K. voted to leave the EU in June of 2016. Since then, the U.K.’s stock market has dwelt in investors’ doghouses – with the prospect of Brexit depressing U.K. stock valuations. Such extreme thinking is music to my contrarian ears. First, if you look at just the headlines, you’ll think the U.K. economy is about to fall off a cliff. In reality, the U.K.’s economic backdrop is surprisingly robust. The economy is set to grow 1.2% this year. The unemployment rate stands at 3.9% – its lowest level since 1975. Wages are also rising at their highest rate in a decade, leaving consumers flush with cash. Second, the U.K. stock market is one of the cheapest in the developed world. The FTSE 100, the U.K.’s leading stock market index, is trading at 13 times earnings – a massive discount compared with the 18 times earnings the U.S. market is trading at. The FTSE 100 is also yielding a juicy 4.9%. That’s more than double the 1.8% yield on America’s S&P 500. Third, doom-and-gloom predictions notwithstanding, Brexit – whatever form it takes – won’t sink the British Isles into economic oblivion. Despite the efforts of Frankfurt and Paris, highly paid bankers are decamping to jobs in other parts of the EU at lower-than-expected rates. Post-Brexit London will retain its position as a leading global financial center. If the U.K. exits with a Brexit deal, then it’s back to business as usual – except under amended terms. If the U.K. crashes out of the EU without a deal, yes, there will be chaos and unexpected consequences. Still, the U.K. will muddle through. In either scenario, at current valuations, Britain is a buy. Profiting from a rebound in the U.K. stock market is as easy as buying the iShares MSCI United Kingdom ETF (NYSE: EWU). 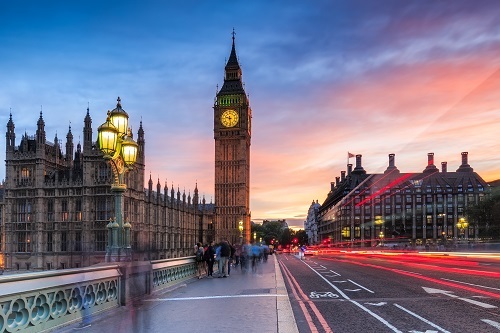 The United Kingdom ETF holds a concentrated basket of large cap and midcap British stocks. Its top three holdings include megabank HSBC Holdings and oil giants BP and Royal Dutch Shell. 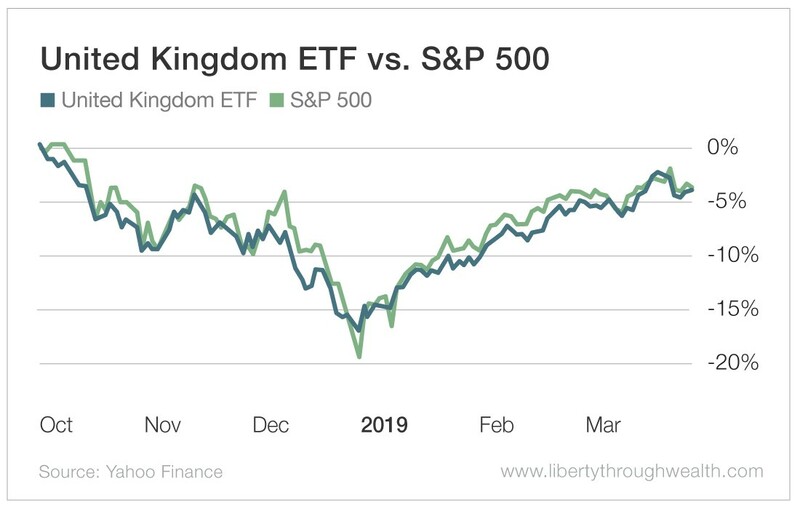 And despite the political chaos that reigns at Westminster, the United Kingdom ETF has matched the performance of the booming S&P 500. The current pessimistic consensus surrounding the U.K. stock market is wrong. 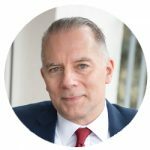 The market will bounce back, just as soon as the Brexit uncertainty is lifted. So is today the moment of maximum pessimism in the U.K.? But I do know that one way or another, Brexit will be resolved. And the moment that happens, British stocks will soar.